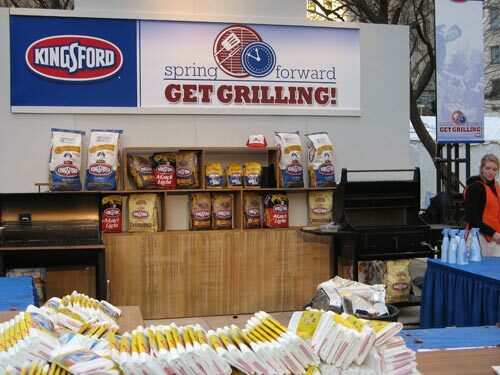 To celebrate the early start of Daylight Savings Time, Kingsford Charcoal hosted a “Spring Forward, Get Grilling” dawn-to-dusk cookout in Madison Square Park. The public was invited to attend charcoal grilling and barbecue smoking demonstrations by four-time Memphis in May world titlist Chris Lilly, barbecue expert Rick Rodgers, and Latin grilling authority (and owner of Paladar) Aaron Sanchez. But most enticing of all: pitmasters would be firing the smokers and grills from 7AM until 7PM, dispensing free barbecue to all passerbys. It was shaping up to be one of those wildly unpredictable weeks of early-March weather: freezing and overcast one day, warm and sunny the next. Today was one of the latter, so I decided to swing by the park after work. I was about a block away when SYB sent a text message informing me that the last of the brisket had been doled out. Alas. 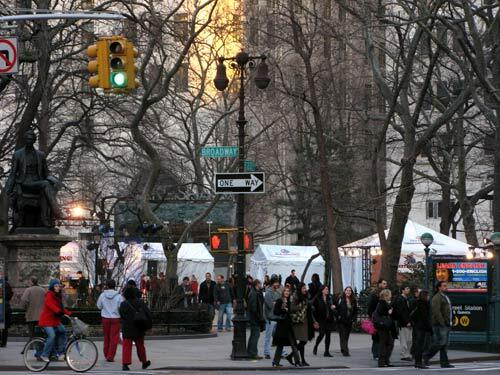 Mark your calendars: The Fifth Annual Big Apple Barbecue Block Party — the Woodstock of New York barbecue — will take place here in Madison Square Park on June 9 and 10, 2007. Fast Passes go on sale beginning Sunday, April 1. The waft of phantom barbecue still hung tantalizingly in the air as the crowds gradually dispersed. All this whetted SYB’s lately dormant taste for meat, so he suggested dinner at R.U.B. a couple of blocks west of the park. Grrr. Still stinging from Sunday’s disappointments, I grudgingly agreed to give the place another shot. Once there, I ordered the pulled pork sandwich, which arrived in a moist, lukewarm heap on a wax paper-covered metal pie plate. Presentation (or lack thereof) aside, it actually was very good (as yesterday’s server had promised)… but probably not 45-minutes good, which unfortunately, is how long it took to be delivered to the table. (What sandwich is?) Good thing we had the hush puppies to tide us over. Does R.U.B. serve the best barbecue on the city? 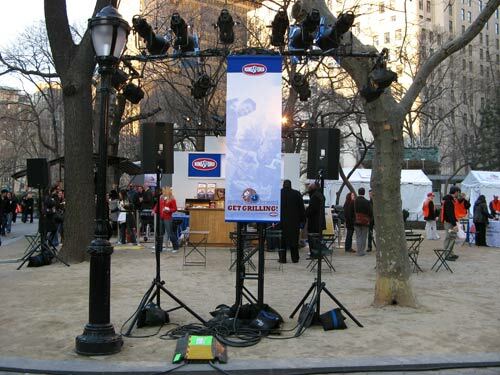 New York magazine declared this ‘cue joint supreme in 2006 and 2007; USA Today listed it among the best in the nation. (The folks at AOL named Virgil’s Real BBQ New York City’s #1.) To be sure, the field of contenders has heated up considerably in the past couple of years — thanks to the likes of Daisy May’s BBQ U.S.A., Blue Smoke, and Dinosaur BBQ. R.U.B.’s menu calls out for broad sampling: the popular “Taste of the Baron,” offers a tasting of smoked meats (turkey, ham, pastrami, beef brisket, pulled pork), chicken and sausage, piled on slices of fluffy white bread and topped with a quarter rack of dry-rub ribs, plus a choice of 2 large sides — all for $45.75. That’s a lotta meat! For those who’d like a little bubbly with their barbecue, there’s “The Empire,” i.e., the “Taste of the Baron,” and a bottle of Dom Perignon for $275. (Intriguing…!) If that seems a bit too precious, there’s always Abita or Blue Moon on draft.